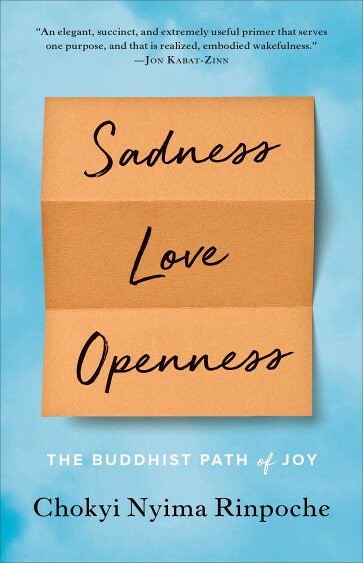 The title of this book, Sadness, Love, Openness: The Buddhist Path of Joy, could belong to any secular self-help book, yet it is of great significance for the secular Buddhist. People want to have their sadness recognized for there is nothing more painful and dark than having one’s sadness dismissed. People want to feel loved, but they also feel scalded by its more volatile forms and hence betrayed. They want authentic and sustainable love that transcends the transitory, that truly endures at a “spiritual” level, regardless of one’s religious or non-religious beliefs. And despite how everyone seems to instinctively close up or shut down in the face of bold new perspectives and possibilities, daring to open up to the bodhisattva path will set one on the path of true meaning and happiness. In the second chapter on the topic of “Love,” Rinpoche understands the need for language that can express conventional or provisional truth (samvrti-satya), indeed he notes that understanding reality as it appears to other subjective agents (for we are subjective agents ourselves) is a stepping stone to further insight. “It’s important that we understand both dimensions: reality as it appears to others and reality as it actually is. . . . We can’t simply write off what others experience as ‘wrong’ and leave it at that. . . . No matter how confused and deluded we may be, we instinctively feel that our experience is real.” There are many paths to practice, but Rinpoche outlines some of the contours of the general, pan-Buddhist vision of the path throughout the chapter, from faith to cultivating natural presence. These issues are highlighted poetically and eloquently, with dozens of subjects addressed with compassion and erudition. In his third and final chapter, Rinpoche explores the notion of openness in two respects: how to open oneself up to the truth, but also how to engage in the act of being open itself: put another way, openness is its own way of being, and characterized by the increasingly focused, pinpointed path of Vajrayana. Rinpoche starts on a general note, and reminds us: “Happiness and the cause of happiness can arise only through loving-kindness and insight into the nature of things. There is no other way.” He then highlights the components of the bodhisattva path, before expanding onto the path of the Diamond: Vajrayana Buddhism, specifically. Chokyi Nyima Rinpoche has penned a truly lovely, compact manual of the Buddhist path. Both perceptive and kindhearted, the book radiates Rinpoche’s presence. I would say that seekers who wish a relatable and simple springboard that catapults them deep into the heartland of enlightened thinking and activity should engage seriously with this digest.